After releasing two songs, Gulaabo and Shaam Shaandaar, which have gone and become super hit songs, the makers of Shaandaar are now planning to release their third song, which is called Nazdeekiyan. The song will showcase Shahid Kapoor and Alia Bhatt do a different kind of dance together i.e. Ballroom dancing. We all know of Shahid Kapoor’s phenomenal dancing skills… So much so, that the actor helped his co-star of Shaandaar, Alia Bhatt perfect her moves. The dance form required knowledge about the technique and also practice. While Alia put in all her efforts into making it look beautiful, Shahid Kapoor helped her through it. This song is a black and white song in this colourful film which is a very rare thing to see nowadays on the silver screen. 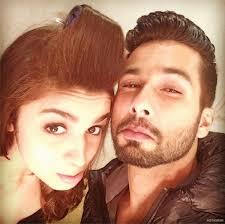 Shaandaar brings to celluloid the never seen before pairing of Shahid Kapoor and Alia Bhatt. The film has created a frenzy amongst its audiences with a series of posters releases which was followed by launching its trailer and the much recently released music tracks. Directed by Vikas Bahl, the film is set to release on October 22nd, 2015. Kriti Sanon up’s her fashion game and rocks in her many avatars!